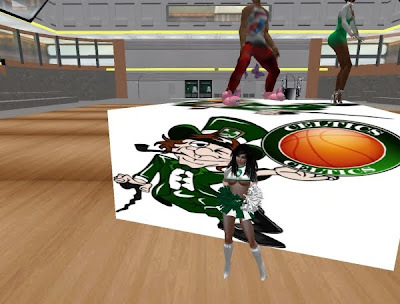 Alpha Cold Arena, December 15, 2010 – Don Asadar, Chairman and Commissioner of the Virtual Basketball Assocation (VBA) announces its debut to the Second Life community. The VBA is the premier basketball league in Second Life consisting of 30 teams mirroring the rl league. Games inworld, outworld and with NBA Live 08 will be played like a realistic game of basketball using a full court – complete with animations for the participants – shooting, slam dunking, dribbling and even stealing the ball from opponents. All scores for games played will be tracked and you will be able to review progress using the VBA website (http://vba-bball.com/), ultimately leading the East and West Conferences to the Championship at the Alpha Cold Arena! The VBA audience is vast within and outside of the virtual community – promising to be the most recognized sports league in Second Life. We offer a variety of outlets to reach our fans, VBA Website/Blog, Alpha Cold Arena Mall, Alpha Club, VBA Fan Store, broadcasts inworld, radio, special events and interactive advertising. Interested in a store in the Alpha Cold Arena? Contact TOPAZ Collins, VP of Sim Operations for more information. Interested in reaching out to our fan base by advertising your business? Interested in co-sponsoring a VBA event? Contact Gladiola Mistwallow, VP of Marketing for more information. Gladiola is tasked with the development and implementation of a unified marketing strategy that leverages the Alpha Cold sim, mall, and all league teams in order to improve profit margins. She will work on building the VBA "brand" to give the organization greater visibility with the SL universe. Plans for advertising in various media are well underway as well as the development of the leagues' website, twitter and Facebook page. Gladiola's boundless energy, creative expertise and business savvy will skyrocket the VBA to their rightful place in annuals of the Second Life! Contact Gladiola Mistwallow, VP of Marketing for all media and sponsorship inquiries.